It's no secret that companies are big fans of monthly and annual subscription plans: people are far more likely to continue paying for a service through a subscription model than they are if they had to make a conscious decision to pay every month. 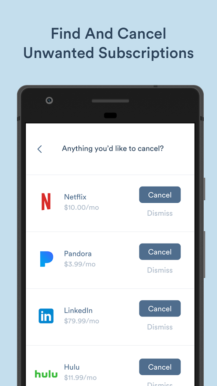 By removing the friction and thought process involved, purchases effectively become opt-out instead of opt-in. That makes it easy to rack up hundreds of dollars in monthly payments, which is why Clarity Money presents users with an overview of all their subscriptions services, letting them cancel any directly from within the app — and potentially saving them a hefty sum. Clarity Money can also recommend better deals on credit cards based on a user's spending habits, and even identify negotiable bills and attempt to automatically obtain a lower rate. Using these methods, last year's 1,000 beta users were able to save an average of $300 through Clarity Money. The app itself is pretty slick and easy to set up. It's also entirely free to download and use (with no in-app purchases either), so there's no reason not to download it and check it out for yourself. Edit: As a few readers have pointed out, the app is, unfortunately, US-only. As someone who has just recently moved from Europe to the United States, I know only too well the frustration of not having access to a product or service due to my geographical location. NEW YORK--(BUSINESS WIRE)--Clarity Money, the personal finance app that acts as the “Champion of Your Money,” announces today the debut of the app on the web and Android devices. Clarity Money is currently featured in the Google Play app store under the “New and Updated App” category. Clarity Money’s expansion to new devices means that the brand will help even more users make smarter financial decisions. Shortly after its January release, Clarity Money was featured in Apple Inc.’s App Store as one 2017’s “New Apps We Love.” Expanding to new platforms was a necessary next step, as Clarity Money’s consumer insights team reported increased demand from non-iOS users. These enhancements are the latest in a series of offerings that give Clarity Money’s 600,000 plus users complete, on-the-go access to their personal finances. 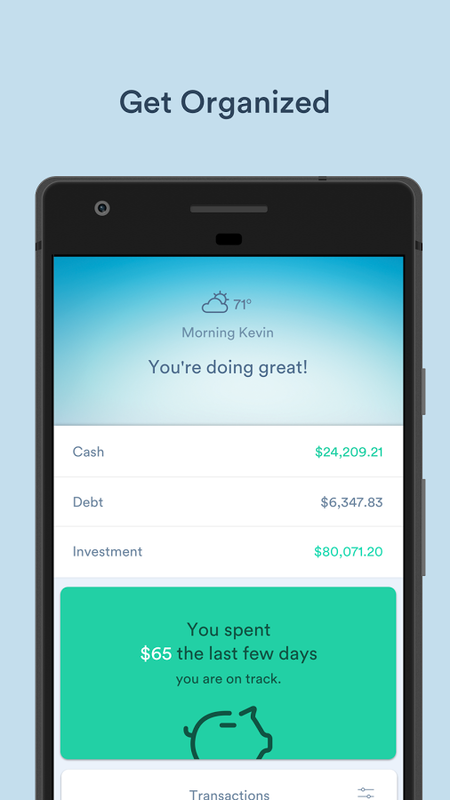 Clarity Money is a personal finance mobile app that acts as your financial champion. 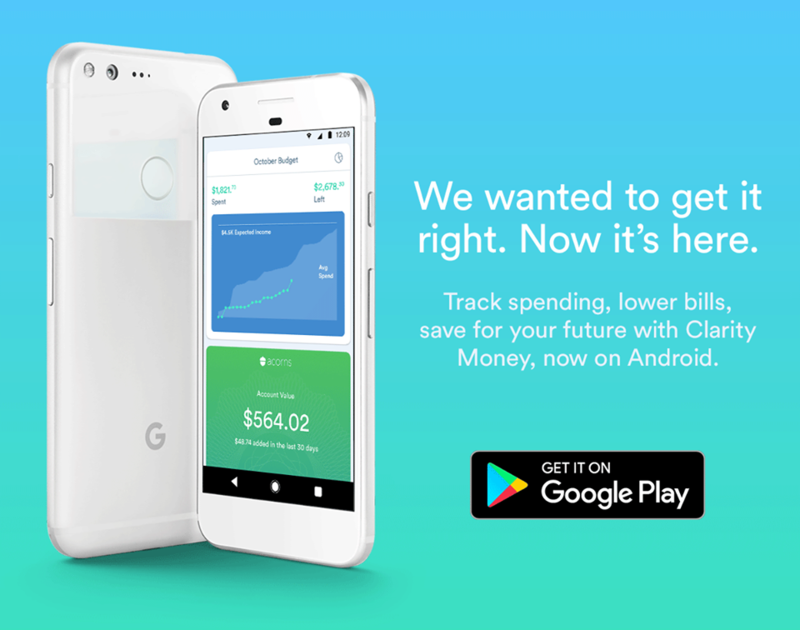 Ushering in a new era of mobile personal finance management apps, Clarity Money uses artificial intelligence and data science to help consumers make smarter financial decisions and get the most from their money. 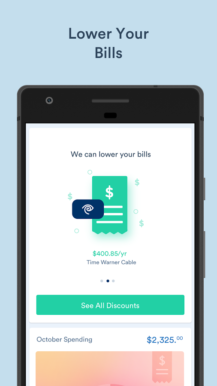 The revolutionary features allow users to cancel and lower bills, get a better credit card, get their credit score and create a savings account, all from within the app, and all at the push of a button. Launched in 2017 by venture capitalist and serial entrepreneur Adam Dell, Clarity Money is backed by leading investors, including Citi Ventures, RRE Ventures, Soros Capital, and Bessemer Venture Partners. To learn more about Clarity Money, click here.